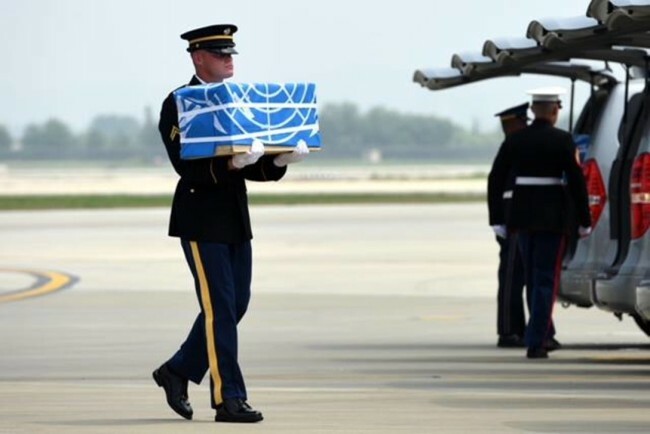 If US officials were to enter North Korea to recover the remains of American soldiers from the Korean War, equipment and payment incurred in the process should be exempt from the UN sanctions imposed on North Korea, a senior US official has said. In an interview with Radio Free Asia, Kelly McKeague, director of the US Defense POW/MIA Accounting Agency (DPAA), said Washington needs to seek exemption from UN sanctions if payment and equipment are to be sent to North Korea for recovery operations. “In order for us to operate and to reimburse North Korea for expenses incurred, we will have to get sanctions relief from the UN. That’s part of dialogue and discussion,” McKeague said during the interview on Aug 9. The DPAA director said the agency aims to enter North Korea for the recovery projects in spring next year because of weather in North Korea. Previous projects were conducted between mid-March and mid-October, according to Mckeague. Last month, North Korea returned 55 cases believed to contain US war remains as part of the summit agreement made in Singapore. US President Donald Trump and North Korea’s leader Kim Jong-un agreed on the immediate repatriation of those killed during the Korean War. The cases were transported to Hawaii on Aug. 1 where US Vice President Mike Pence participated in a ceremonial reception at the Joint Base Pearl Harbor-Hickam. Experts will conduct a series of forensic examinations of the remains to identify the dead. About 7,700 US soldiers are listed as missing from the 1950-53 Korean War, and 5,300 of the remains are believed to be in North Korea. Some 36,000 American soldiers were killed during the war.